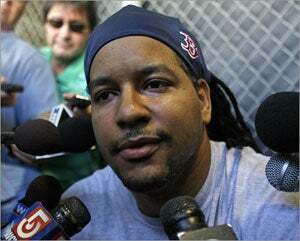 Though he didn’t do it in a formalized setting, Manny Ramirez did decide to speak with the media this morning (watch the video here). This could signal that Ramirez will be heading back to the old days, when he regularly talked to members of the media. He used to, but took a hiatus, finally breaking his silence in the 2007 postseason. How badly would you like to retire in a Red Sox uniform? Does the contract situation give you more determination to show the Sox that you can still play? How do you look at last year, with the number down a little bit? Are you going to approach the Red Sox for an extension this spring? You’ve got two rings. What does that feel like? There were so many years when you didn’t want to be here. What changed? How has being in Boston compared to what you expected when you started with the team? How much of staying in Boston has to do with your teammates? David Ortiz said yesterday that he expects you to have a monster year this year. Why do you think he said that? When you say “it’s up to them,” do you mean it’s up to them to do something before the season starts? You’ve said you want to be like Julio Franco. How long are you going to play? If the team came to you and said, ‘Forget the options, we want to talk long-term deal,” would you listen? He was then asked about when the team was down 3-1 to Cleveland last season, presumably before asking about his comments at that time. Ramirez said, “No, no, no. That’s in the past. I don’t want to talk about that. Next year.” That was it for the interview. After standing up, out of the huge group of reporters and cameras, Ramirez went over to Bob Ryan, shook his hand, and stood talking to him for a few moments. That was it for his press conference. We’ll be back later with more goings-on.